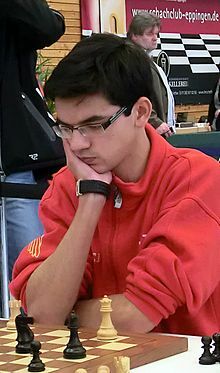 Anish Giri (born June 28, 1994) is a Russian-born Dutch former chess prodigy and Grandmaster. He achieved the grandmaster title at the age of 14 years and 7 months. Giri is a four-time Dutch Chess Champion (2009, 2011, 2012, and 2015) and won the Corus Chess B Group in 2010. He has represented the Netherlands at three Chess Olympiads (2010, 2012, 2014). Giri was born in St Petersburg on 28 June 1994 to a Nepalese father (Sanjay Giri), and a Russian mother (Olga Giri). In 2002, he moved to Sapporo, Japan with his parents and lived there until 2008. Since February 2008, Giri and his family have been living in Rijswijk, Netherlands where his father works at a research and consulting foundation. He has two sisters, Natasha and Ayusha. In June 2013, Giri finished high school at Grotius College in Delft. His favorite subjects included physics, mathematics, geography and history. He married Sopiko Guramishvili on 18 July 2015. Giri's first club was a local youth sport club 'DYUSH-2' in St. Petersburg, Russia. His trainers in this club were Asya Kovalyova and Andrei Praslov. He was a member of the Japan Chess Association and the Sapporo Chess Club during his stay in Japan. Giri developed quickly as a junior, his rating increasing rapidly between April 2006 and July 2010 from 2114 to 2672. 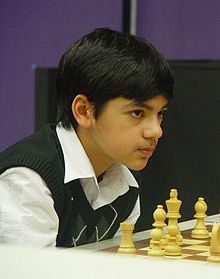 Giri shared first place in the Russian Higher League Under-14s Boys Championship scoring 6.5/9, winning the St Petersburg Boys Under 16s and coming third in the Under 18s event in 2007. The next year saw him share first at the Blokadny St Petersburg Open and win the Petrograd Winter Open scoring 8.5/9. He followed with his first Grandmaster norm, achieved at the Intomart GfK Open sharing first with 7/9 in April 2008, sharing second at Kunsthalle GM Open and reaching his second Grandmaster norm at Groningen by sharing fourth place with 6.5/9. Giri's first appearance at a major tournament came in his shared second place at Corus Chess Group C in January 2009 giving him his third GM norm, his Grandmaster status being confirmed in June. He also shared second at the Dutch Open, won the Dutch Championship and shared second at the Unive tournament. His performance in the previous year's Corus Chess Group C earned him a spot in Group B in 2010. He won the tournament with a score of 9/13, half a point ahead of Arkadij Naiditsch. Despite a disappointing result in the European Individual Championships, he drew a match with Nigel Short and won the Sigeman & Co tournament scoring 4.5/5, coming second in the Dutch Championships behind Erwin L'Ami and was one of the best scorers for the Rising Stars team during the NH tournament against the Experienced team, but was unable to qualify for the Melody Amber tournament, losing on tiebreaks against Nakamura. It was revealed in May 2010 that Giri had aided Viswanathan Anand in preparation for the World Chess Championship 2010 against challenger Veselin Topalov. Anand won the match 6.5-5.5 to retain the title. At his debut appearance at Tata Steel in 2011 he scored 6.5/13 and defeated Magnus Carlsen with Black in 22 moves. He also became Dutch champion for the second time and shared first place at Sigeman & Co with Wesley So and Hans Tikkanen. Despite being the lowest ranked player, Giri won the 2012 Reggio Emilia chess tournament, claimed his third Dutch championship and shared third place at the strong Biel Chess Festival. His solid improvement continued with fourth place at the Reykjavik Open and a match victory against Vassily Ivanchuk at Leon in 2013. Giri took part in both the 2012/13 and 2014/15 FIDE Grand Prix cycles, but failed to qualify to the Candidates Tournament on both occasions. In 2014 Giri shared second place at the Tata Steel tournament, won individual bronze for his first board performance at the 41st Chess Olympiad in Tromso and finished second at the strong Qatar Masters Open. Giri's current coach is Vladimir Tukmakov. He was previously coached by Vladimir Chuchelov. Giri has represented the Netherlands at three Chess Olympiads earning two individual Bronze medals and scoring a total of 20 points from 29 games(+13=14-2). Giri has played for numerous clubs in team tournaments including SK Turm Emsdetten since 2008 in the Chess Bundesliga, HSG (Hilversum Chess Society), the Delftsche SchaakClub (Delft Chess Club), HMC Calder and En Passant. He plays in Spanish league for chess club Sestao Naturgas Energia. He used to play in the French league (TOP-16) for l'Echiquier Châlonnais and Russian league for SHSM-64 (Moscow). Giri is fluent in Russian, English, Dutch and is moderately proficient in Japanese, Nepalese and German. He likes to play football and table tennis. He annotated a number of top games for the popular chess site ChessBase, and has written several articles, including analysis of his own games for chess magazines, such as New in Chess, 64 (chess magazine), and Schach Magazin 64. He used to be a columnist for the magazine ChessVibes Training. He has been regularly contributing to his own official website. In 2014, Anish Giri published his first book, My Junior Years In Chess.